Transitions will kill you — those moments when you're ending X activity and beginning Y event. I don't like them personally, but with four kids transitions are the moments of weakness. Everybody is in limbo a little bit, and it's when things get lost and shoes get thrown and there's great potential for us all to end up in a weeping pile of humanity by the back door. Not pretty. Plan for transitions by setting aside enough time for them, making them as systematic and routine as possible, and then getting through them (and, hence, on to the next thing) as quickly as possible. No, don't rush. Just keep things moving. 2. Resist the urge to control-freak on details. You have to control-freak on some things, or nothing would ever get done. But details are a waste of your energy. Make sure, for example, the bed gets made, but don't waste time making sure the sheets are wrinkle-free and the throw pillows are stacked in an alternating color arrangement. You get me? This applies to everybody; make sure the article gets written, the project gets done, the budget gets made, the garage gets cleaned, whatever. But don't flip out about how those things get done. 3. Quit cleaning after every mess. I'm all for cleanliness, but I'm also for accomplishment. Sometimes the two are enemies, because if you're taking time to clean after every single mess, big or small, you're creating a hundred transitions between work and clean-up when you could just focus on the work and then have one clean-up time at the end. Cleaning does need to happen, but it doesn't need to happen constantly. 4. Have a set time for cleaning and other routine physical chores. If you have a designated time for the cleaning and other chores, you can relax and know that you'll be able to get to it at that time. This is true not just for work-from-home folks who get the privilege of doing laundry in between calling clients; this is also true for folks who work in offices or factories or shops. Do your important work and hold to a set time for filing papers, clearing your desk, straightening the shelves, wiping the display counters, putting away tools, etc. Clutter — both physical and mental — is an enemy of productivity. Clutter will make your space seem dirty even when it isn't, which will make you want to clean instead of work, which will keep you distracted and give you lots of great reasons to procrastinate. Cut the clutter. Set up systems. Get storage containers. Get rid of stuff you don't need anymore. Label everything, and put things away where they belong. 6. Work in terms of daily goals. It's good to have a schedule and a daily plan, but when you work from a schedule divided into 15-minute increments, you can get thrown off by one long-winded caller. Set a schedule if it makes you happy, but try to think and work in terms of your goals for the day. Figure out what they are first thing in the morning (or, better yet, last thing at night the day before). Get started on that most important goal and keep at it, coming back to it after every interruption, until you've accomplished it. Then move on. Interruptions will happen. Schedules will get completely ruined. But daily goals? You can remember them (without a planner), and you can keep coming back and plugging away no matter what happens in the meantime. 7. Do a weekly plan-and-divide. Pick a time for a weekly planning session. I like Sunday night, for the obvious reason that it comes right before the beginning of a new week. Preferably do this when you're feeling motivated and fairly energetic. (An espresso does the trick for me...) Write down all the things you want to accomplish on Monday. Go ahead, be ambitious! Then stop. Don't make any more lists for Tuesday, Wednesday, and so on. Instead, divide Monday's list out into the whole week. You'll be looking, most likely, at a reasonable amount of stuff to do within a week, given all your other obligations, events, activities, and the invariable interruptions. 8. Start out with a vengeance. Conquer the morning, and you have conquered the day. This doesn't mean you have to get up at 4 a.m., though I personally find I'm much more productive when I do get up early. But get up, get through your morning routine, and get started as soon as possible on the most important task for the day. You'll set the tone — energy begets energy, and progress begets progress. And you'll also get to your most-important-thing first, so if the rest of the day does fall apart, you've still reached that goal. The little things kill you in two ways — you either overestimate or underestimate how much time they will take. If you overestimate, then you keep putting that task off because you think you don't have time for it. Meanwhile, it's a mental distraction, hanging over you and keeping you from being as productive as you could be. If you underestimate, then you get caught up in that little task and spend far more time on it that it deserves. Facebook, anyone? Use a timer to find out how little time some tasks take, so you know you can get them done in between phone calls. And use a timer to stop yourself on those other tasks that tend to eat up more time than they should. 10. Expect an ebb and flow of productivity. No matter what the productivity gurus might say, nobody can be at 100% maximum output all of the time. We all have different work rhythms to consider, as well as normal living and working patterns that affect what we can accomplish. Figure out what your best work hours are and try to get a solid block of time then to do your most important work. Then expect that you'll tone down in productivity, get some smaller tasks done, or take a break. The same goes for the days of the week; I find that I usually have a very productive, energetic day followed by a more mellow day. If you pay attention and see your own patterns, you'll be able to schedule unavoidable but less-important stuff (meetings, reports, things like that) for your less-productive times and mellow days. Then you can focus your best hours and most energetic days on the most important work. Do you have any real-life productivity hacks from your own experience? Share them in the comments so we can all benefit! I'm always looking for ways to get more done in a day and have a good time while I'm at it. Thank you for this article. 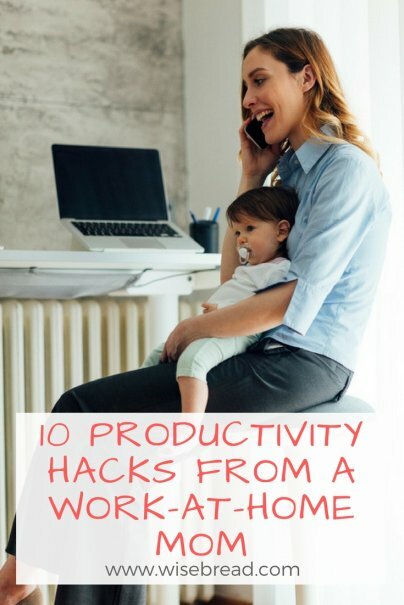 I've lately been trying to utilize tips like these and are seeing improvement in my home life. I've never read an article that sums up so many scattered ideas I've come accross so nicely! I will keep it and share with others.